From the MIT roboticists who created the world's first flying monkey comes flying, driving drones. Roboticists at MIT's Computer Science and Artificial Intelligence Laboratory have developed a quadcopter drone with wheels. It drives and flies autonomously. The drones can swarm in groups. And they can do so without colliding with each other. There's an important innovation breakthrough here. Current drone robots that are good at one form of transportation aren't good at another. The MIT drone is good at both flying and driving. This same team of roboticists previously created a robot called the "flying monkey". The monkey flies, runs and grasps objects. But it isn't autonomous. The researchers program its paths. It can't safely travel on its own. But it has served as a foundation for the roboticists next iteration on their innovation theme - flying, driving drones. The MIT scientists call their flying, driving drone a "flying car." 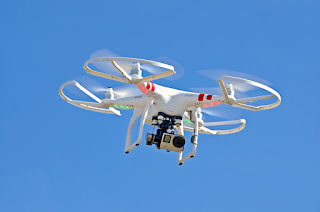 They've developed eight, 4-motored quadcopter drones. The drones have 2 small motors with wheels at their base. In simulations they drive 825 feet and fly 300 feet before their batteries run out. The researchers believe these hybrid drones are more efficient and versatile drone vehicles than those that only drive or fly. And the hybrid quadcopters allow the researchers to test multiple concepts for flying cars.